To use Microsoft Office 365, an organisation must allow traffic to [and sometimes from] the respective cloud services via the internet on specific ports and protocols to various URLs and/or IP addresses, or if you meet the requirements via Azure ExpressRoute. Oh duh?! To further expand on that, connections to trusted networks (which we assume Office 365 falls into this category) that are also high in volume (since most communication and collaborative infrastructure resides there) should be via a low latency egress that is as close to the end user as possible. As more and more customers use the service, as more and more services and functionality is added, so to will the URLs and IP addresses need to change over time. Firewalls and proxies need to be kept up to date with the destination details of Office 365 services. This is an evergreen solution, lets not forget. 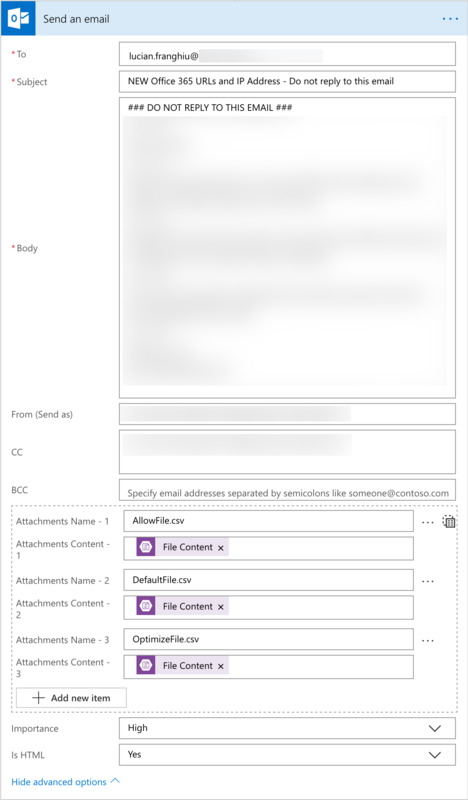 So, it’s important to put the processes in-place to correctly optimise connectivity to Office 365. It’s also very important to note that these processes, around change management, if left ignored, will result in services being blocked or delivering inconsistent experiences for end users. 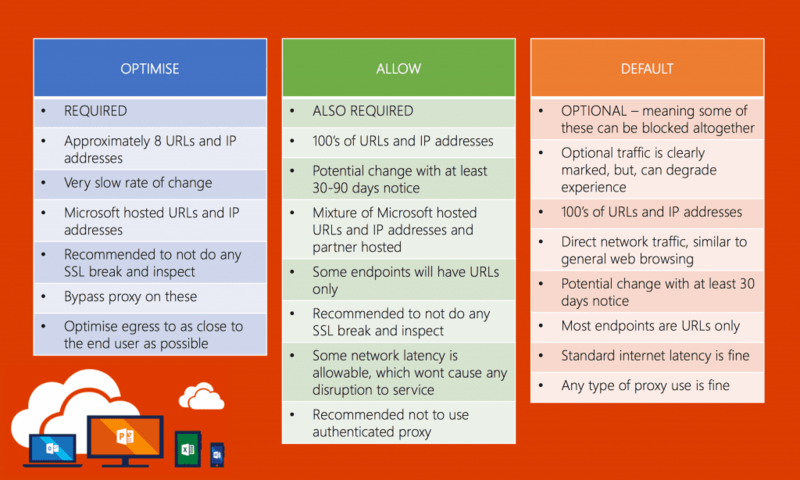 Come October 2nd 2018, Microsoft will change the way customers can keep up to date with these changes to these URLs and IP addresses. A new web service is coming online that publishes Office 365 endpoints, making it easier for you to evaluate, configure, and stay up to date with changes. Furthermore, the holistic overview of these URLs and IP addresses is being broken down into three new key categories: OPTIMISE, ALLOW and DEFAULT. It’s not all doom and gloom as your RSS feed no longer works. The new web service (still in preview, public preview, at the time of writing this blog) is rather zippy and allows for some great automation. So, that’s the target state: automation. Microsoft wants to make it nice and easy for firewall, proxy or whatever edge security appliance vendor or service provider to programmatically interact with the web service and offer dynamic updates for Office 365 URL and IP address information. In practice, change management and governance processes will evidently still be followed. In most circumstances, organisations are following whatever ITIL or ITIL like methodologies are in place for those sorts of things. The dream Microsoft has, though, is actually one that is quite compelling. NOTE – for my use case here, the details for the output is purely IP addresses. That’s because the infrastructure that the teams I’ll be sending this information to only allows for that data type. If you were to tweak the web service request (details further down), you can grab both URLs and IP addresses, or one or the other. My first instinct here was to use Azure Automation and run a very long PowerShell script with If’s and Then’s and so on. However, when going through the script, 1) my PowerShell skills are not that high level to bang this out and 2) Flow is an amazing tool to run through some of the tricky bits in a more effortless way. Assuming, dear reader, that you have some background with Azure and Flow, here’s a detailed outlined of the process I went through (and one that you can replicate) to automate checking and providing relevant parties with updates to the Office 365 URLs and IP address data. Login-AzureRmAccount -Credential $cred -ServicePrincipal –TenantId "[tenant id]"
Having done many Office 365 email migrations, I’ve come to use Powershell and CSV’s quite a lot to make my life easier when there’s 1000’s of records to work with. This process uses that experience and that speed of working on a solution using CSV files. I’m sure there’s better ways to streamline that component, like for example using Azure Table Storage. I’m also sure there’s better ways of storing credential information, which, for the time being isn’t a problem while I work out this new process. The overall governance will get ironed out and I’ll likely leverage Azure Automation Credential store, or even Azure Key Vault. If you, dear reader, have found a more streamlined and novel way to achieve this that requires even less effort to setup, please share! 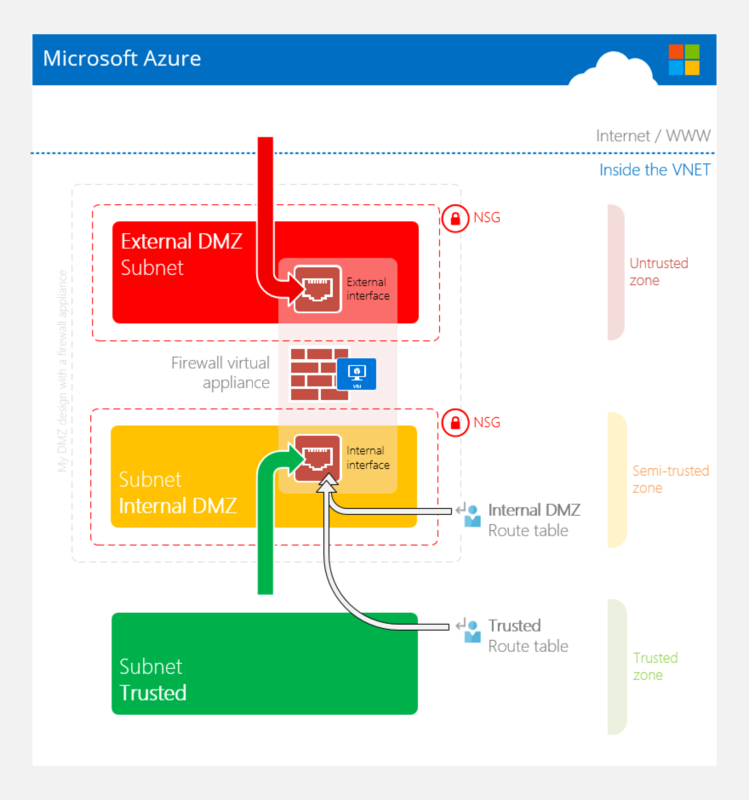 Isolating any subnet in Azure can effectively create a DMZ. To do this correctly though is certainly something that is super easy, but, something that can easily be done incorrectly. Firstly, all that is required is a NSG and associating that with any given subnet (caveat- remember that NSGs are not compatible with the GatewaySubnet). Doing this will deny most traffic to and from that subnet- mostly relating to the tag “internet”. What is easily missed is not applying a deny all rule set in both the inbound and outbound rules of the NSG itself. Ive seen some clients that have put an NSG on a subnet and assumed that subnet was protected. Unfortunately, thats not correct. Ive seen some clients that have put a deny all inbound from the internet and vice versa deny all outbound to the internet and assumed that the subnet was protected and isolated. Unfortunately, thats also not correct. 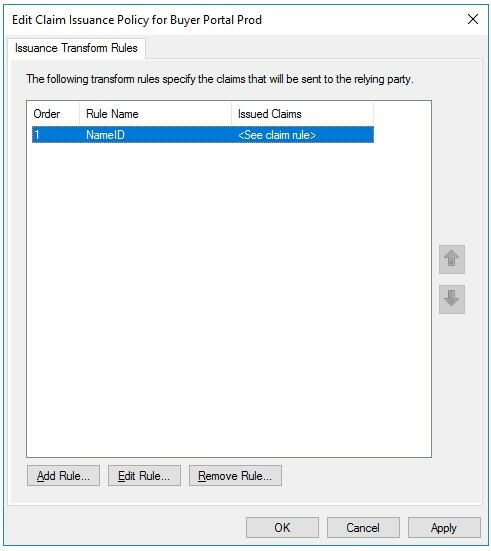 Azure has 3 default rules that apply to an NSG. With these 3 rules, there’s the higher in order two rules that can trip people up. The main culprit being rule 65000 means that any other subnet in your VNET and any other VNET that is peered with your VNET is allowed to communicate with your given subnet. 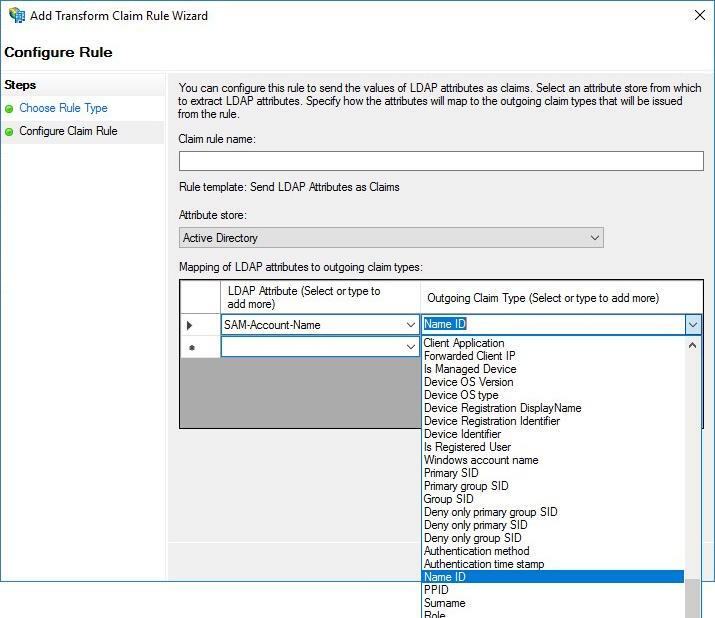 Warning #1 – This rule denies traffic from AzureLoadBalancer and may affect virtual machine connectivity. 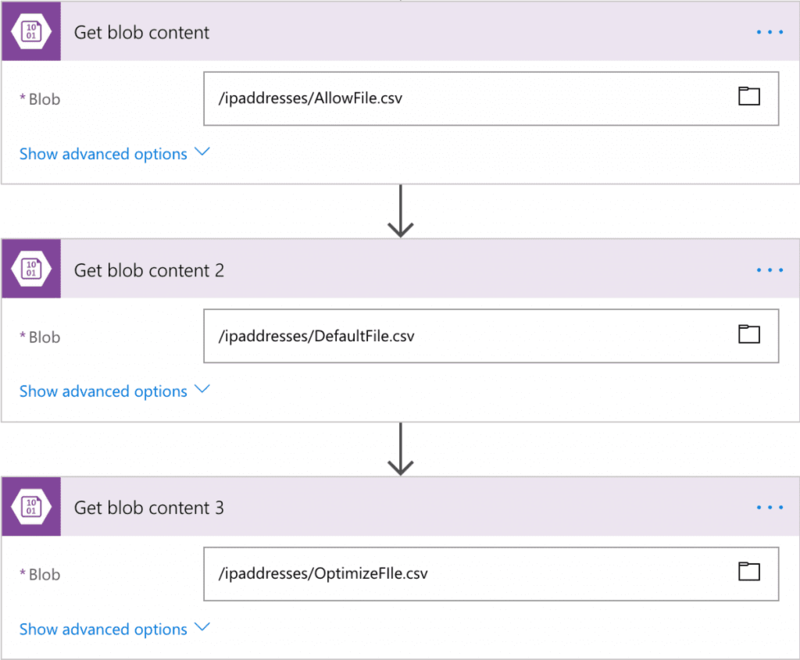 To allow access, add an inbound rule with higher priority to allow AzureLoadBalancer to VirtualNetwork. Warning #2 – This rule denies virtual network access. If you wish to allow access to your virtual network, add an inbound rule with higher priority to Allow VirtualNetwork to VirtualNetwork. With that, the Azure load balancer and VNET traffic from other subnets within the same VNET or other VNETs through peering will be denied. Thus, we have a true isolated subnet and one that can be setup as a DMZ. Before I go, I just wanted to quickly mention that in Azure NSGs are also able to be applied to a single network interface. If you flip the methodology there, its quite easily possible to have no NSGs on any subnets, but rather, apply those NSGs on every interface associated with servers and instances in a VNET. There is a key drawback though with this approach- administrative overhead. With an NSG associated with a server instance, again following my correct deny all rule mentioned earlier, a single NIC or a single server instance could be isolated in a sudo DMZ. The challenge then is, if this process is repeated across 100 servers, keeping all those NSGs up to date and replicating rules when servers need to communicate on various ports or protocols. Administrative overhead indeed! Original posted on Lucian.Blog. Follow Lucian on Twitter @LucianFrango. Now that Microsoft Intune is accessed via the Microsoft Azure portal, there has been a steady stream of weekly updates to the platform, improving things (for the most part) along the way. As of the end of November 2017, there was announced an interesting new feature that should become part of most Intune environments. The key feature of note is the new ability to have multiple Network Device Enrolment Servers (NDES) configured for use with Intune. NDES allows mobile devices running without domain credentials to obtain certificates based on the Simple Certificate Enrolment Protocol (SCEP). With this update, multiple NDES connectors are supported. 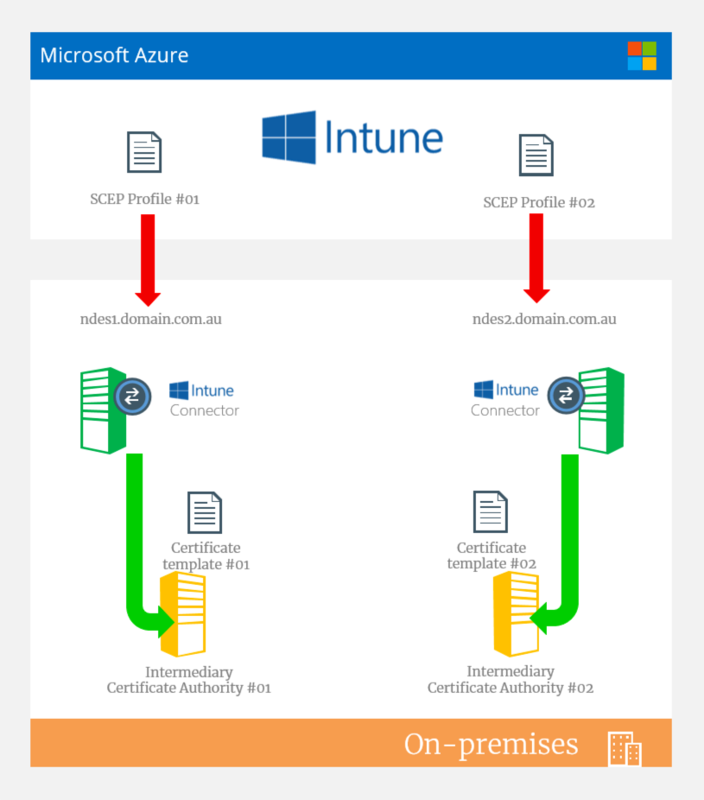 The existing integration of NDES with Intune meant that you had the ability to leverage SCEP via NDES to have Intune enrolled devices automatically request and receive certificates from your internal CA for use with such awesome things like WiFi profiles for 802.1X authenticated WiFi with certificates. With this update, you can now have multiple NDES servers in your environment. Again, why is that significant? NDES is limited in configuration to proxy certificate requests to a single intermediate certificate authority. So, with multiple NDES support, your standard CA architecture that would likely consist of multiple intermediary CA’s, can now be leveraged by Intune. As you can see we’re limited to NDES communicating with a single intermediary CA. This poses problems around designing a highly available, cloud first environment. You never want to have a single point of failure as public cloud providers don’t like you having a single instance anywhere. Azure for example has always recommended at least two instances in an availability set. Note: Yes, you can now have premium storage with the same SLA as two instances in an availability set, but, you still have a single instance bottleneck. My opinion. To clarify the heading there- this isn’t a highly available solution. There’s a district difference which I won’t go into the nuances of high availability here, but, just for your information there would still a manual process involved to update SCEP profiles in Intune. This is because each SCEP profile would point to a single NDES on-premises namespace. Theres no option to direct to an alternate should the primary be offline. There’s also no options for load balancing either. Such is the way NDES is designed/built. I consider it “higher” availability as you have multiple instances of NDES talking with the same intermediary CA and using the same certificate template. Should one NDES go offline, you would have a pretty speedy means to “fail over” to the alternate NDES server. 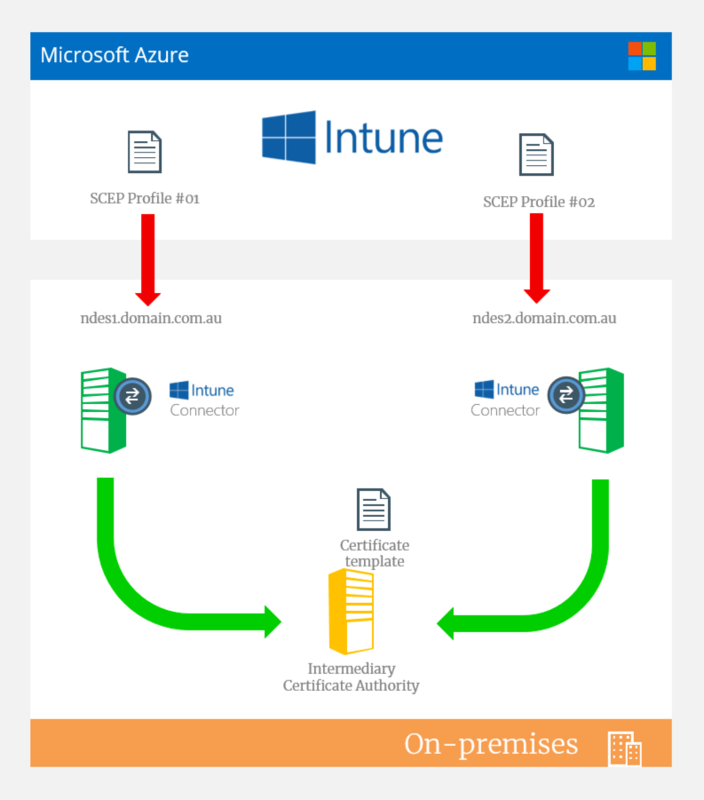 But, like I mentioned earlier: it’s a manual process to change the SCEP connection in the Intune profile. To deploy in an active/active pattern, this required that each NDES server leverage either a different intermediate CA and optionally a different certificate template type. This means that in Intune you can have more than one template type and both NDES servers servicing different profiles. A good example is a specific requirement for an extremely short period of time for certificate expiry for one app/service in Intine, while also needing a very long expiry for another app/service. 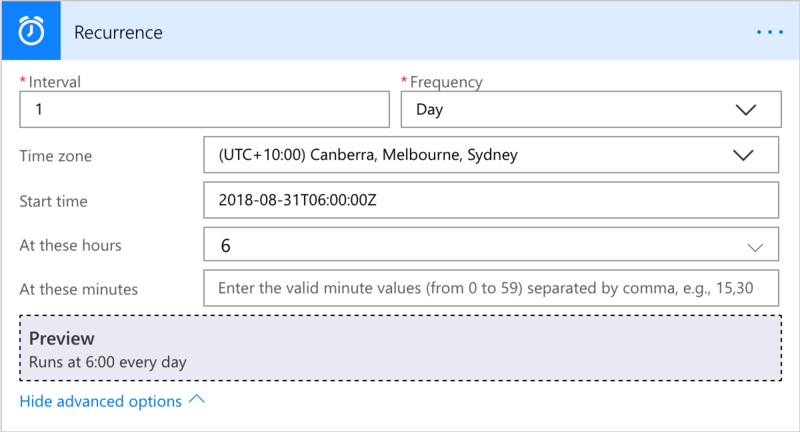 Even though Intune says you can set an expiry in the profile you create through Intune and the Azure portal, that does not hold true to the certificate template configuration on your CA. Therefore, you need multiple NDES servers and to leverage different certificate templates with different expiries. 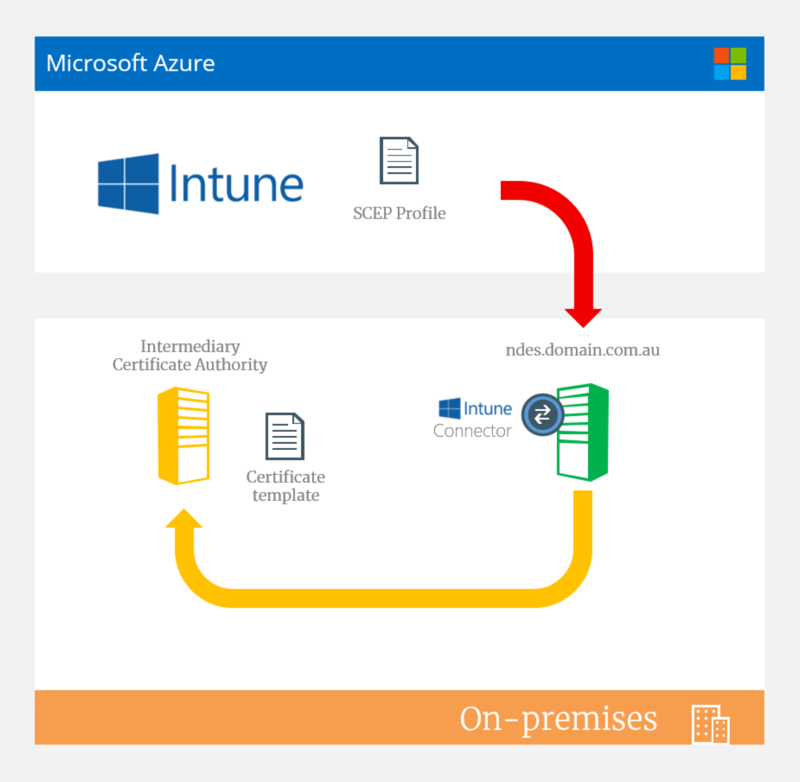 The overall solution options and patterns and advancement of Intune makes for some good use cases and expands the possibilities of certificate based authentication. What I would like to see next is the ability to see the template name in Intune that NDES is using to make it easier to follow the bouncing ball. Something that the Intune connector for NDES could pick up and forward to Intune maybe. There’s probably multiple ways to do this, both right and wrong, but, here’s a process that I’ve been using for a while that I’ve recently tweaked to take advantage of new Azure Managed Disks. That aside, Managed Disks are a pretty good feature that makes disk and storage account management considerably simpler. If you’re frugal with your VM allocation and have the process to manage people and technology correctly, Managed Disks are great. If you’re wanting to do this to create copies of your VM instances, to scale out your workload, remember to generalise or sysprep your VM instance prior to Step 1. In the example I go into below, my use case was to create a copy of a server from a production environment (VNET and subscription) and move it to different and seperate non-production environment (seperate VNET and subscription). The first thing we need to do is actually power off your virtual machine instance. I’ve seen that snapshots can happen while the VM instance is running, but, I guess you can call me a a little bit more old school, a little bit more on the cautious side when it comes to these sorts of things. I’ve been bitten by this particular bug in the past, unpleasant it was; so i’m inclined to err on the side of caution. Once the VM instance is offline, go to the Azure Portal and search for “Snapshots”. Create a new snapshot. Save the generated URL to notepad for later! Before we actually create a new VM instance based on this snapshot blob, there is an additional option we could take. That is, perhaps it would make sense to move the blob to a different subscription. This is particularly handy when you would have a development environment that you would want to move to production. Other use cases might be the inverse- making a replica of a production system for development purposes. It can’t get any simpler or faster than that. I’m sure if you’re command line inclined, you have a quick go to PowerShell cmdlet for that, but, for me, I’ve found that to be pretty damn quick. So it isn’t broken, why fix it. The final piece of the puzzle, as the cliche would go, is to create a new virtual machine instance. Again, as the wonderfully elusive and vague title of this blog post states, we’ll use PowerShell to do this. Sure, ARM templates would work and likely the Azure Portal can get you pretty far as well. However, again I like to be efficient and I’ve found that the following PowerShell script does this the best. Additionally, you can change this up to mount the VHD from blob, vs create a new managed disk as well. So, for purpose of creating a new machine, PowerShell is as flexible as it is fast and convenient. And that is pretty much that! It’s Friday in Sydney. Its the pre-kend and it’s a gloomy, cold 9th day of Winter 2017. I hope that the above content helps you out of a jam or gives you the insight you need to run through this process quickly and efficiently. That feeling of giving back, helping. Thats that feeling that should warm me up and get me to lunch time! Counting down!